Not all wildlife removal companies are the same. Some have experience with bat removal projects, and are familiar with the proper methods for bat exclusion. But others use incorrect techniques, such as bat traps, summer exclusions, or worse, fumigants. Do your research before you hire someone! - Always perform a proper live exclusion. - Never use poisons or fumigants or kill bats. - Never use traps or attempt to relocate bats. - Never do a removal during the maternity season. - Seal all entry points shut with guarantee. - Offer attic cleanup and decontamination. - Properly Virginia licensed and insured. As I discuss repeatedly on this website, bat removal projects are not easy, and not for amateurs. I have seen many horrible attempts at bat colony removal throughout the years, done both by do-it-yourself homeowners and by incompetent companies. Never hire a Yorktown pest control company that uses poisons for rodent or insect control. They often attempt the same approach for bats. Not only is this incredibly destructive and illegal in Virginia, but it results in disaster for the homeowner, and does not actually solve the problem. It's very important that the removal of bats from the attic of your home is done in the correct manner, and there is only one correct way, with a live bat exclusion. To read more about this process, read my bats in the attic home page. Before you hire anyone, including Cornwell's Wildlife Control, LLC, talk to them, and make sure that they understand what they are doing, and that they have experience. Be sure that they do abide by the principles I outlined above. This is not just for the sake of the bats - I'm no tree hugger - it's for the sake of doing the job correctly, for you and your property. The fact that it's good for the bats as well is a lucky coincidence. And really, bats are good animals, which I'm sure you realize. I hope you have a good experience with your Yorktown bat control project, and with Cornwell's Wildlife Control, LLC. You can email me personally if you have any problems with this company, and I will talk to them, but I doubt that will be necessary. Good luck! Hi, I found one hibernating bat in our attic guest bedroom, up in the peak of the gable. I could get him out, but I'd have noplace to put him and he'd freeze to death. Pretty sure it's only one. We haven't heard anything much, and there isn't guano anywhere. Just a little right under where he's sleeping. I figure if we get him out, we can look for the gap in the soffit or whatever next spring, since not many of these fellas are flying around this time of year. You don't kill them, do you? Do you let them sleep it off someplace until spring? Please let me know what you'd charge and what you'd do with the little guy. I found two bats under my plastic christmas tree bin in the attic and I know they are hybernating at this time because it is winter in Virginia right now. I am not really sure what to do with them. When I move the box and saw them, they did move a little so I know they are still alive. What would you suggest I do with them. I know I will need to deal with this in the spring on a larger scale and what you have written will help, but for right now while cleaning out the attic I may come across more that are hybernating. thank you for you help. David - I found out about your services on line. My family and I live in Hampton VA and have a tri level home. We have noticed some scattered droppings in the attic that I thought were chipmunk or large mouse droppings. I had vacuumed the few we had up and went on with the daily routines. I checked in the attic again sometime later and it appears that the number of droppings are increasing. We do not hear anything like chipmunks or mice up in the attic but have caught a couple of bats in the house over the past couple of years. We just had our house resided with new soffits. I fear that the droppings in the attic may be from bats. Now that we just resided with new soffits, we may have made matters worse by closing off any entry/exit routes. Please advise on what it would take to have your services in reference to finding out what we may need to do. 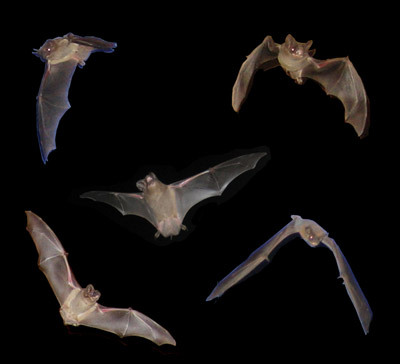 For bat removal in Yorktown, call Cornwell's Wildlife Control, LLC at 757-690-7627. 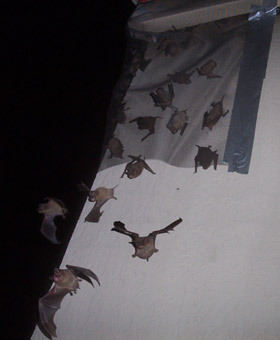 They can remove bats in attics throughout Virginia, but they mostly operate in the greater Chesepeake Bay area, as the recognized best bat control company in the area. Please be kind to bats! They are valuable animals, not aggressive, and they are vulnerable!